This is the fifth episode in a blog post series about our Small Book of a Few Big Rules. If you don’t know what we’re talking about, take a look at the first episode. Be helpful and don’t be afraid to ask for help. It was the last Friday of the month, and I knew what that meant (besides cake—Friday always means cake for my team). It was time for another edition of My Friday and, this time, I was determined to attack a very much awaited project. But, where are my manners? You probably don’t even know what My Friday is. On the last Friday of each month, the Research and Development (R&D) department at OutSystems organizes an initiative called My Friday, where you’re free to work on whatever you want. You can use that time to work on a new product, prepare a presentation, or learn something new. Like I said, whatever you want. A long time ago, someone in the OutSystems Community had suggested an idea for a new feature for our low-code platform. To answer your question, yes, you can share ideas for new features in the Community, and the ones with the most upvotes will be “cooked” by us (if it’s a legitimate idea and we can do it). And this particular feature had a lot, and I mean a lot of upvotes. I had been planning to work on it for some time, but there was always some new and urgent project that I had to prioritize. I ended up leaving that one behind. But not this time. Not this Friday. That Friday morning, I arrived at work at 9:00 a.m., as usual, to start that super challenging project. And everything was going great. I was just coding away. But suddenly, out of nowhere, I blocked. I just couldn’t move forward. And if you’re a software developer you know how frustrating that can be. I could have just given up and tossed that project to someone else. But I didn’t. I chose to use the “help” card. Just like Gotham uses lights to call Batman, I used lights to call my most expert and trustworthy colleagues (and we always keep the lights off on my team’s desks). And, just like Batman, they came from the shadows to help me. And every time that I blocked, I asked for help again. And if they couldn’t help, I sent the light signs into another direction and the help would always arrive. That, right there, is the help rule in action. 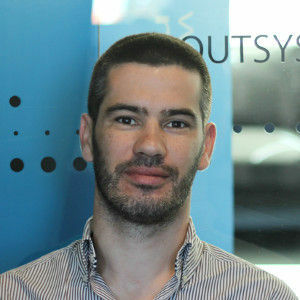 When I joined OutSystems straight out of university five years ago, I thought: “It’s time to leave the child inside of me behind and step into the world of adults. It’s Darwin’s law, the survival of the fittest. You’re either Korn or Nickelback.” But that didn’t happen. In those first days, I realized that this company was almost an extension of my previous life. Look at it this way: if you know that the person sitting next to you has just joined the company, you know that person is lost. That’s normal, and it happens to all of us when we’re dropped into a new company and have to work with 600 new people we’ve never seen before. So why wouldn’t you help them? We’re a collective body of knowledge. Of course, some people are more knowledgeable in certain areas than others. But if we help each other and pull other people into a conversation, we might just learn something new. For example, suppose we have to change the license for our product, but the person usually responsible for that it’s on his honeymoon. Are we supposed to wait a full month until his return and let it impact our customer? No, and we’re not supposed to bother the poor man that’s on his honeymoon either (yes, this really happened). This is where the help rule shines the most. It not only helps us spread knowledge but also helps us reach solutions much faster. Two heads think better than one, right? And that’s good for us, as employees, because we know we’re never alone; there’s always an extra hand right there. So, there’s no need to freak out; we’re a team after all. But it’s also good for our customers because we’re able to innovate and reach new solutions much faster. I know there are plenty of companies out there where people are pressured to solve problems by themselves. And it’s great if you can do it alone, but if you can’t, there’s nothing wrong with that. It’s better to ask for help than to spend an hour staring at your laptop trying to figure out something you don’t even know where to start. This way, you solve it faster, and can just move to the next project. That’s why the help rule is so important. Oh, about that the Community feature: it isn’t ready yet, so I can’t reveal much about it. But I can tell you this: if you’re a Community member and you use OutSystems, I’m pretty sure you’ll be very happy. Currently on the App Backend team, Lara started as a ninja on a more tactical team when she joined OutSystems. With a not-so-secret crush on everything related to data, Lara is a newbie in photography and a veteran metalhead who will never miss a good concert and is always willing to discover more bands.